Ask fellow campers about "Frontier Town RV Resort & Campground" and nearby attractions. Arrived on Labor Day which unfortunately was the last weekday the water park was open. Sites were shady under the tall pine trees but the ground was dusty and dirty. (It might be better if the staff didn't rake and remove the pine needles.) The pool chairs need a scrubbing. Campground staff was very friendly and helpful, especially at the Lazy River Saloon. We camped at Frontier Town RV Resort & Campground in a Motorhome. Nice paved roads. Nice paved sites but told they were not open in November. Bathrooms were clean but showers have push button. You must keep pushing it every minute. Super dog parks. There are 2 separate ones with plenty of room to run your dog, nice shaded area too. Nice store and helpful employees. We camped at Frontier Town RV Resort & Campground in a Motorhome. The park is very clean and some sites are paved. The only problem I have is the non paved site that we where in had no grass so it was very sandy. We camped at Frontier Town RV Resort & Campground in a Motorhome. An expensive resort with many activities for families. Fun water slides and pool area. Camp store has everything you need and more. Staff was very friendly. We took advantage of the shuttle bus to Ocean City which we enjoyed, but we wish the buses were air conditioned (old school buses) and run more often back and forth. This is a resort campground in a resort area and the price reflects it. We camped at Frontier Town RV Resort & Campground in a Motorhome. 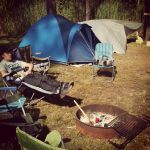 Bring a bike or rent a golf cart as this campground is large. Mixed emotions. If you're in the center areas of Frontier Town you're either going to be choking on dust or mired in mud, depending on Mother Natures mood. To avoid it you have to pay the extra high fee of getting a site on the outskirts or one of the waterfront sites in this very large park. The setting of the sites around the marina are great. (we've been in Z3, Z4 & Z8). They're beautiful and serene. But that's why there is a steady stream of walkers and (speeding) golf carts on their way to the "point" to enjoy the view. That's my gripes. 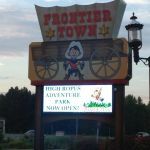 The good points of Frontier Town have been documented by others and I agree with them also. 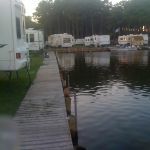 We camped at Frontier Town RV Resort & Campground in a Motorhome. 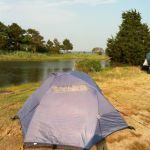 High energy Ocean City is a short drive away and lay-back-and-relax Assateague Island is even closer. Thank you for your feedback! We're happy to hear you enjoyed our waterfront sites! Considering what you get for the high price, the value here is pretty good. The fees include daily access the park's water park which is great, especially for smaller children. The water park has a large kids pool with a slide play area in its center. It also includes a large water slide atop a large man made hill for bigger kids and adults and and has a large lazy river which one floats on in single or double tube inflatables. The water current is continuously moving so you can either just float around the large loop or go faster if you kick and swim in the tube. There is also a large swimming pool near the Marina and pavilion area in the main campground. Most sites have full hookups. Water electric sewer and cable access. The WiFi is either OK or terrible depending on how far you camp from a node and how crowded the park is. Another cool feature was the large dog playing area where you can set your dog free from its leash and watch him run and roam and meet new friends. They also have a good bus service to Ocean MD beaches and other attractions for only a buck. The camp store is well stocked and the roads are mostly easy to navigate with some tight spots, but this is not your worry when driving, the place literally packed with golf carts everywhere. This along with the small site sizes were my only issues with the campground, otherwise, it's a great place for the family and we've been going now four years in a row. Paid extra features include a Wild West town with a gun fight. 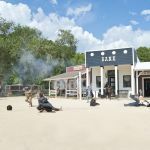 A train robbery on a small tracked train that winds through the woods, a zip line, and a pretty decent rodeo. We camped at Frontier Town RV Resort & Campground in a Motorhome. We appreciate you taking the time to review our resort! We're glad to hear you've had a great experience camping with us over the last 4 years and we hope to have you and your family back again soon! We have stayed here several years. Some sites are better than others but overall a wonderful park with great activities especially for kids. We camped at Frontier Town RV Resort & Campground in a Motorhome. We absolutely love Frontier Town! We have gone there every summer for the past 6 years. 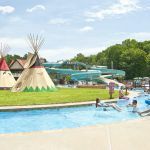 Love the fun activities for the kids and especially love the lazy river! Fun place for great family time and memories. Would be nice if the cost of the golf cart rental was a little cheaper though. It does get expensive, but you certainly do need a golf cart, as the park is very large. We always enjoy our stays here. We camped at Frontier Town RV Resort & Campground in a Motorhome. When you call to reserve your spot, also reserve your golf cart at that time. Golf cart rentals go fast! You don't want to be without one. Perfectly level site. Front desk picks up phone everytime here, does not put you to voicemail everytime like campground up the street. Strong wifi & Att cell signals. Second night free everyday in April. Free golf cart for every site this weekend too. Late checkout 5pm is free too during off season. Clearly the best deal overall within 10 miles radius. We camped at Frontier Town RV Resort & Campground in a Motorhome. Food Lion grocery 5 minutes away. Assateague 5 minutes away. This is a great campground, it has plenty of amenities right in the park, including two dog parks (under and over 25 lbs.). Store has everything you could need or forgot to bring with you. The view from our spot in section Z was amazing. We thoroughly enjoyed our stay. We camped at Frontier Town RV Resort & Campground in a Motorhome. We were here in April which is low season and half price. WiFi is excellent. They allow you to checkout at 5pm if no one is behind you. Pony express check-in is excellent. No need to get out of RV. Excellent resort as described by others, but it is these key points that make it better than any other resort in the area. We camped at Frontier Town RV Resort & Campground in a Motorhome. Not very accommodating. We called 14 months in advance for three sites together. Were told that they couldn't do it at the time but keep calling. We called for four months straight. Nothing! Also too crowded, too many golf carts, too noisy, only one pool. I'll never go there again. We camped at Frontier Town RV Resort & Campground in a Motorhome. This was our first visit. We elected to stay because of the school aged children activities. In perspective; it's a busy place, a breeding golf cart farm and all around on dusty roads. The staff needs help with customer service and welcoming the guest. Customer service is less than desirable- but then again, why would they care about you when you're just a drop in the bucket? We stayed on Z lane "premium" sites. Concrete pad does not justify "premium" sites nor the $100/night charge. 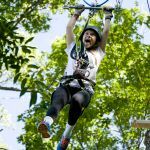 There are plenty of activities for children. The picture I gathered was a "mom-n-pop" amusement park on the bay. It is all about the dollar at this place; they charge for practically everything. In a summary - you're just a number. We camped at Frontier Town RV Resort & Campground in a Motorhome. Do NOT stay here except off season, unless you have a high tolerance for noisy neighbors. Too many campers this week have been using liquid courage, and are inconsiderate with loud radios, loud cars, etc. Was assaulted & cursed by a guy who'd set up right next to the path to the bath house, with barking dogs & blaring radio. Been here all week and have been unable to enjoy the shore birds we like to watch, because of all the man-made noise. Early in the week it was tree and grass trimming crews. Now the place is filling up with noisy "cruiser" cars and the sort of inconsiderate people who own them. Also the Wi-Fi service is far worse than in previous years, so I can't even hide inside surfing the web. This stay has been unmitigated hell for me. We camped at Frontier Town RV Resort & Campground in a Motorhome. Very close to ocean city. Use the shuttle bus. Pack light. Food available onsite very reasonable. Within 10 min drive of plenty of restaurants and shopping. Assateague was only 10-15 min, see the wild horses and go to the beach. Kids caught 2 small fish from the small pier. Are you affiliated with Frontier Town RV Resort & Campground ?